What Does It Mean To Have An Acquired Brain Injury? All brain damage that is caused by events that happen after birth is considered an acquired brain injury. These injuries are distinguished from genetic or congenital disorders that effect the development of the fetal brain; they are also distinguished from disorders caused by fetal alcohol syndrome, illness of an expectant mother, and other conditions that effect the fetus when it is still within the womb. These injuries are also distinguished from damage to the brain caused by neurodegenerative disorders such as Alzheimer’s disease, Parkinson’s disease, and the aging process, among other conditions. While traumatic brain injuries are a major cause of temporary and permanent brain damage, some acquired brain injuries are not caused by physical trauma. Drug and alcohol overdoses are a common cause of acquired brain injuries. Prescription drugs, when administered to the wrong patients or in the wrong amounts, can cause acquired brain injuries. Patients who are choked to unconsciousness, deprived of oxygen, exposed to hazardous chemicals, or poisoned may also suffer from an acquired brain injury, even though the head itself was not physically injured. Strokes, brain tumors, infections, and many other conditions that effect the flow of oxygen-rich blood to all of the parts of the brain can cause acquired brain injuries. Can I Sue Doctors For Acquired Brain Injury? Pursing damages for an acquired injury not caused by a traumatic event is a very complicated and difficult field of law. In some cases, medical malpractice, or a mistake made by a doctor or other care provider, may be involved. Malpractice may involve prescribing the wrong drugs, the wrong combinations of drugs, or the wrong dosages of drugs. It may involve mistakes made during treatment of an expectant mother or the birthing process. Failures of medical equipment, human error, lost or incorrect medical records, and other mistakes have all lead to injuries by medical malpractice. In an ideal world, hospitals and other care facilities would have procedures in place to minimize these risks; unfortunately, injuries caused by malpractice are still all too common. These cases are very difficult for attorneys to handle, even when a brain injury is very clear and its consequences are obvious in an injured victim’s life. Judges and juries don’t always understand the intricacies of these cases, and other doctors may be reluctant to testify against a colleague, even when medical malpractice was clear. Proving medical malpractice in court may involve the testimony of expensive expert witnesses or extra time spent combing through medical records. Need To Know More? Get Your FREE Copy of Brain Injury Law! 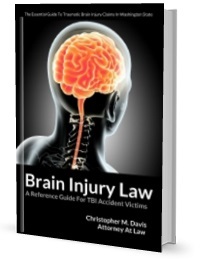 Award-winning brain injury accident attorney Chris Davis has written a series of FREE books, including one about brain injury law cases in Washington state. This book talks about the nuances of accident and injury cases involving traumatic brain injuries and answers common legal questions that accident victims and their loved ones may have about cases involving brain injuries. Get your complimentary copy of "Brain Injury Law: A Reference Guide For TBI Accident Victims" absolutely free by clicking the "Order Now" button below. ?Are ‘minor’ brain injuries dangerous? ?What is a traumatic brain injury (TBI)? ?What is an open head injury?